Back for a fourth time by popular demand, The Upsteppers present their 1 Massive Version showcase. 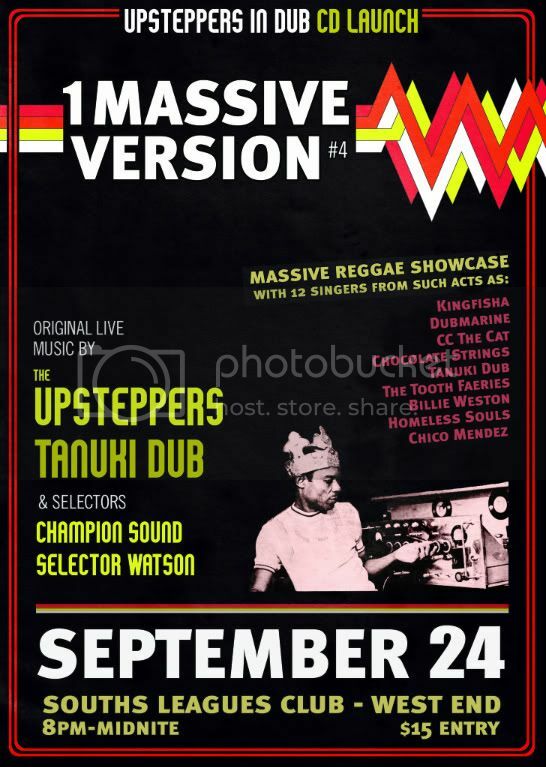 Hosted by The Upsteppers, the 1 Massive Version set brings together 12 top-notch singers who each perform a version of their favorite classic reggae tune. The Upsteppers play as the live backing band for each singer, delivering the sound in an uncompromising big-band format; with full horn section, rhythm section, skanking guitars and organs. This 1 Massive will cast the net wider, featured singers from such acts as Dubmarine, Kingfisha, CC The Cat, along with singers Marcello Milani, Ofa Fanaika, PaulieB, Billie Weston, and many more. The Upsteppers will also be taking the opportunity to launching their brand new album Upsteppers In Dub, and exciting new full-length collaboration with producers from a close-knit community of dub music lovers. Audiences will also be treated on the night to original live sets by The Upsteppers and Tanuki Dub, as well as vintage-vinyl DJ sets from Champion Sound and DJ Paul Watson. Love these shows, one of my favourite Brisbane nights. See you all there! singers are sounding awesome. this is gonna be the biggest and best yet. Keep an eye out for Marcello, Kazman, PaulyB and Billie Weston among the hugest tunes of the evening. Tonight! Looking forward to seeing Brisbane out in force for this one! LICK IT BACK SELECTA !! Yes another great night ONE MASSIVE VERSION was ! Amazing singers backed by a great Brisbane band. We certainly are blessed with some wonderful artists in Brizzy. James and the UPSTEPPERS were in fine form and the singers were KILLA ! and Johnny Wailer made the right mood for everybody to move. the list goes on .....10 or so different singers and songs. Thank You Jim and Paulie and all the artist who make Reggae live in Brisbane........... and that's LIVE live ! Now only if we could get Tony out of Sicknee and up to Breezney !!!! How about it Tone ? good to see ya back on here Bingstah! Thanks Hua, Can't leave the Reggae too long ! ONE MASSIVE.....was another great nite ! Maximum respek to James and the UPSTEPPERS.